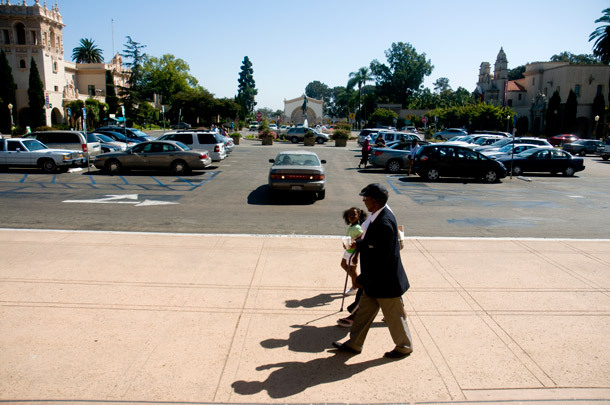 A controversial plan to overhaul the center of Balboa Park has long been on hold and it’s likely to remain that way for months. But the project’s going to court on Monday, reports VOSD’s Lisa Halverstadt. Superior Court Judge Gregory Pollack is set to preside next week over one of two cases that have kept the Plaza de Panama project on pause for nearly two years. The case, filed by San Diegans for Open Government, argues the city should have asked voters to weigh in before approving a plan to use bonds to cover its share of the $78 million project. Meanwhile, our Lisa Halverstadt finds a second case filed by Save Our Heritage Organisation awaits a hearing at the state Court of Appeals that could be months away. SOHO, which has argued that the city should have conducted more environmental reviews when it revived the project in 2016, is appealing a Superior Court decision that largely favored the city. Mayor Kevin Faulconer and the Plaza de Panama Committee, led by philanthropist Irwin Jacobs, say they remain committed to the project despite the delays and are confident they’ll prevail in court. Yet court filings reveal delays have led to escalating costs that could imperil the project – and opponents show no signs of backing down. A city audit released Thursday tries to quantify the San Diego water department’s billing errors. It found the department sent out at least 2,750 bad bills last year, writes VOSD’s Ry Rivard. The audit was meant to see if there were systemic billing problems. While it found the department had to correct thousands more bills before they were sent to customers, the auditors nonetheless determined many problems could be blamed on a few handfuls of city employees and that, by and large, the department is doing a good job. The audit, though, hints are other issues inside the department, including problems with the city’s $60 million plan to replace conventional water meters with automated “smart meters.” Because of that, the auditors said that as the department installs more smart meters, it needs to take steps to “ensure that these issues are continuously monitored.” Left unsaid is that the whole point of smart meters, after all, is to automate a process rather than complicate it further. An outside consultant also released a report on billing issues Thursday. The report, by West Monroe Partners, had similar findings about overall billing problems, but had a different take on the smart meter program. It said the city should actually accelerate the rollout of the smart meters across the city. Mayor Kevin Faulconer said the city plans to adopt measures recommended by the auditors to prevent billing errors in the future. “These audits show that less than one quarter of one percent of bills were issued incorrectly, but percentages don’t matter if you’re the one overbilled,” he said in a statement. The County Board of Supervisors approved three projects equaling to nearly 4,000 homes Wednesday. Two of the projects are in eastern North County, near I-15 and SR-78, and one is a re-zone in eastern Otay, which would allow for residential, commercial and industrial development. The Otay project, by far the largest of the three, will be built near the U.S.-Mexico border, east of SR-125. The re-zone will allow up to 3,158 residential units, 78,000 square feet of commercial space and 765,000 square feet of industrial development on a 253-acre site that was previously zoned for industrial development. That faces no opposition. The two smaller projects in North County, however, are more controversial, primarily because of wildfire safety concerns, reports the Union-Tribune. There are several projects asking for county approval that exist in areas of tremendous wildfire risk. Harmony Grove Village South, a mixed-use community on a 111-acre site about a mile from both San Marcos and Escondido, that will include 453 homes and 5,000 square feet for commercial. The second project approved, Valiano, will include 326 homes on a 239-acre site north of Harmony Grove Village and its plan includes 326 single-family homes and detached condominiums. Thursday marked the Trump administration’s deadline to reunify “eligible” families with children over 5 who had been separated. The deadline was created by San Diego District Judge Dana Sabraw, who’s overseeing the case challenging family separations. The government said Thursday that 1,442 children in this group had been reunified with parents. There were 378 children discharged in other situations, such as to sponsors. There are still 711 children in custody of the Office of Refugee Resettlement because the adult isn’t “eligible” for reunification or available. There were 431 children whose parents are “outside the U.S.” or, in other words, were deported. Many nonprofits have been working to try to locate parents who have been sent back to their home countries without their children. One attorney told KPBS that they’ve only found about a dozen so far. Another 120 children won’t be reunited with their parents because their parents waived reunification, according to court documents. In affidavits filed by the ACLU, however, many attorneys said parents were misinformed, coerced or tricked by immigration agents into waiving their right to be reunited with their child. On Friday, the ACLU and government will be back in court to argue deportation stays for reunified families and the fate of those who the government deemed “ineligible” for reunification. San Diego Unified’s class of 2017 graduation rate was 86.6 percent, Times of San Diego reports. Voice of San Diego looked into the 2016 graduation rate at the district in an investigation that adds important context to the numbers. Around the Voice of San Diego office, and on the VOSD Podcast, we’ve heard our CEO Scott Lewis do a lot of complaining about how hard it is to reserve a campsite in California via an online system launched last August. NBC 7 takes the story from here. There’s an ongoing debate about what’s better: a San Diego-style burrito or a San Francisco, aka Mission-style burrito? One of the main differences between the two is that S.D. tortillas are warmed on a grill and S.F. tortillas are steamed. “Case closed,” reads a new post on Reddit. “Mission burritos are trash.” The poster uses an eloquent takedown by Los Angeles Times food critic Jonathan Gold, who passed away over the weekend, as proof. The Morning Report was written by Maya Srikrishnan and Kinsee Morlan, and edited by Sara Libby.